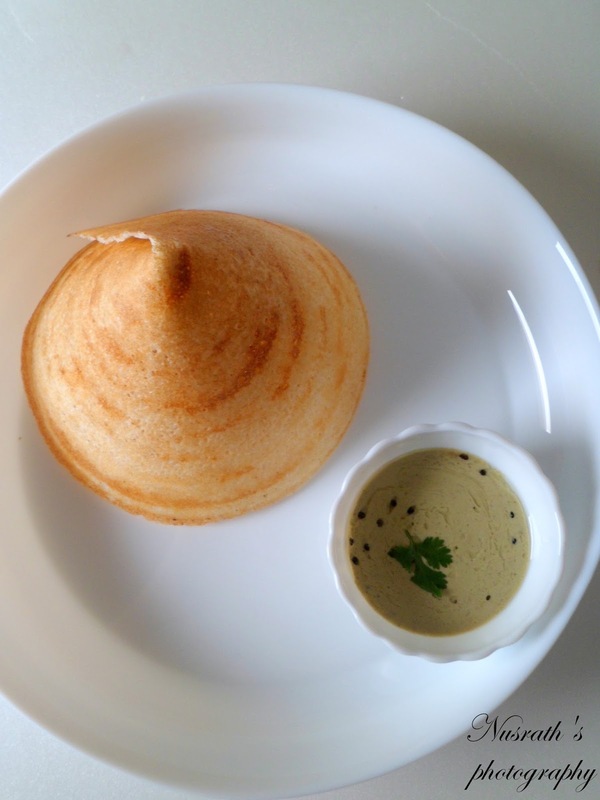 By looking at the picture and title of the post you must have understood that today's post is dosa .Paper roast dosa or Sada dosa as it is generally referred. Idli's and dosa's are the most common south Indian breakfasts or you can say an integral part of south Indian cuisine .Paper roast or Sada dosa or ghee roast, if drizzled with generous amount of ghee (clarified butter) is a paper thin rice crepe usually served with sambar and chutney . I have grown up eating home made dosa's and idli's ,and thank god that my kids too are lucky enough to be fuelled with home made food .Though making dosa batter at home from scratch calls for some pre- planning but it is worth the time and energy invested .Yup " THE FRUITS OF LABOUR ARE ALWAYS SWEETER ",in this context crispier, on the outer layer and soft at the inner layer .Usually a wet grinder is used to grind the batter ,but I have always seen my mother and grand mother grinding it in the mixer . So me too walk in their foot steps and make the dosa batter in table top mixer . The secret to crispier and perfect dosa is primarily the ratio of rice to urad Dal (black gram),followed by soaking time and fermentation .If the urad Dal and rice aren't soaked appropriately you will end up with a grainy batter.And if the batter has over fermented this will lead to sour dosa and if it is under fermented then rubbery dosa will be on your plate. Every south Indian home has their recipe for the batter and this is my fail proof recipe that I have been following for years now .Initially when my dosa's were an utter flop many of my friends recommended ponni rice or idly rice.But I wasn't satisfied with the result .Some of them suggested to add methidana (fenugreek seeds) or puffed rice(murmura) to the rice-urad Dal( black gram ) at the time of soaking .There is no right or wrong method it is just which method and quantity suits you according to your geographical location.Back home we use sona masoori the local rice but here I go with basmati or sona masoori as per availability . We soak rice and Dal separately as both have different grinding point Dal grinds faster as compared to rice . so if we mix and soak it together Dal will turn smooth faster where as the rice Will remain grainy . When you are done with all the procedure perfectly and when you make dosa on the flat tava( pan) it just sticks to it . Does this happen to you ? yup I have encountered this one too .firstly the tava for dosa should always be a separate one meant only for dosas.And still if you don't want to invest in another kitchenware then just cut the onion into two halves prick a fork on the back side of onion and grease the cut part on the tava ( pan ) . the juice of onion will prevent the dosa from sticking . Her is a pictorial recipe with a video on how to spread the batter for a dosa .Shooting with camera in one hand and cooking with the other hand is definitely a herculean task ,but I had to start it somewhere. Hope I have covered almost all the queries but still if you face problem do ping me a comment here or on social media . 1.Clean wash and soak rice and Dal separately for at least 6 hrs . 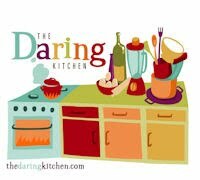 2.In a mixer jar meant for wet grinding ,add drained urad Dal first and grind it first with out water later add very little water and grind to a smooth paste. 3. Now add cooked rice with little water and grind to a paste. 4. Drain water from the soaked rice and grind it, by adding Little water at a time to a smooth paste. 5.Mix ground urad Dal ,rice ,cooked rice with hand in deep bottomed container or a box or a steel vessel. 6. Close the lid and place it in a warm place to allow it to ferment over night or at least for 8 hours . If the climate is cold then preheat the oven for 5 mints switch off and place the batter in the oven to ferment. 7. 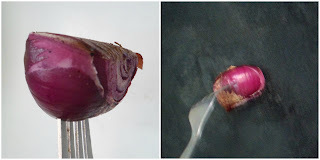 Next day morning add salt and bicarbonate of soda and whip it with a spoon for one minute, this will allow aeration . 8. Rest aside for 5 minutes .Now cut the onion into two halves prick a fork on the back side of onion and grease the cut part on the tava ( pan ) . the juice of onion will prevent the dosa from sticking . 9. Heat the tava or flat griddle on medium heat ,place a dollop of the batter on the tava and spread it in circular motion . 10. Drizzle it with ghee or oil ,once it turns to golden brown scrape it out from the side fold as you like it ,no need to cook on the other side . 11.Your dosa is ready to be served with chutney and sambar. My boy looooves dosa,we have it with chutney and potatoes. Thank you hiba. ..my boy too loves dosa with amul butter. 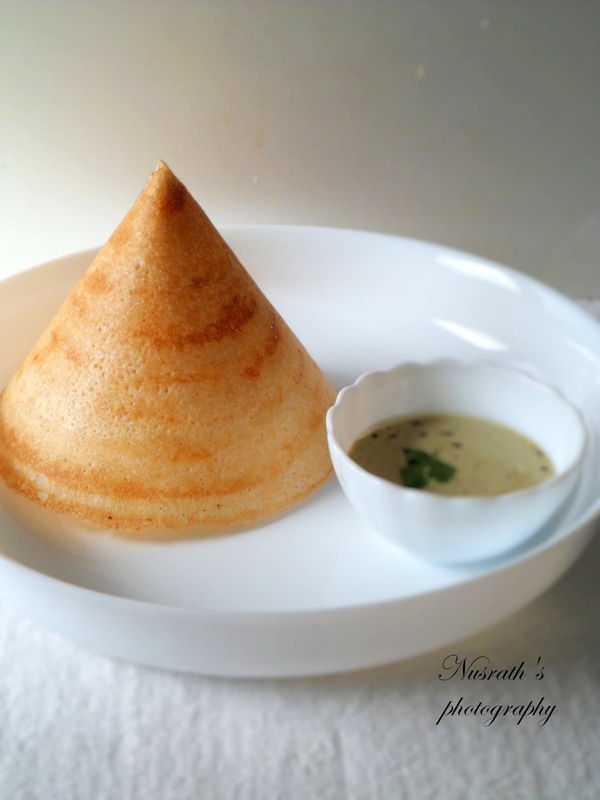 Wow that dosa looks so perfect with a lovely golden colour! Thank you Rafeeda, dosas demand patience and expertise.